Why Did Satan Have the Jewish Religious Leaders Kill Jesus, When It Was Christ’s Death that Defeated Satan? How could the Pharisees and Sadducees not have known through the Holy Scriptures that the Christ was supposed to die as the final sacrifice for God’s children and thereby fulfill the prophecies of what was written about Him? If Satan is truly so intelligent and knows God’s Word better than we do, then why did he have the Jewish religious leaders put Christ to death, since he must have known that if Christ died, it would seal his own doom (i.e., Hebrews 2:14)? Wouldn’t you think that Satan would have tried to do the opposite and prevent Jesus from being killed, so his own doom wouldn’t have been sealed and the price wouldn’t have been paid for our sins? Those are very interesting questions. To answer the first part of your question, the Pharisees and Sadducees didn’t know Christ’s death would pay the price for the sins of mankind. Nor did they know His resurrection from the dead would ultimately doom their father, the devil (Genesis 3:15; Hebrews 2:14). The Pharisees and Sadducees hated Jesus for what He was teaching, particularly His teachings against following empty religious tradition (i.e., playing church) instead of worshiping God. In Matthew 23:13-39 Christ Jesus absolutely excoriates the Jewish religious leaders for their adherence to religious tradition and their subsequent hatred of the Word of God and willing ignorance of its meaning. So with the exception of Old Testament legalism, the Jewish religious leaders — mostly false Jews, which is to say, children of Cain — were as scripturally ignorant as an atheist. That’s why Christ had to ask “Have ye not read?” so many times, when the Jewish religious leaders would pepper Him with questions. They hated, loathed and despised Christ because His teachings, being directly from the Word of God, were directly contradictory to their own empty religious traditions. They were teaching man-made religious traditions and Christ was teaching God’s actual Word, i.e., His spiritual truth. So Christ was making their synagogues irrelevant. He was drawing people out of the synagogues while heaping scorn and disdain on the role-playing Pharisees and Sadducees for failing to teach the people about God’s honor, authority, character and great mercy. The bottom line is that their hatred of Jesus Christ was strictly earthly, or perhaps better said, fleshly. Just as Satan is jealous of God, so the Pharisees and Sadducees were jealous of Jesus, particularly of His success in drawing people away from organized religion and its phony traditions, and closer to God’s Word and His Holy Spirit of truth and understanding. Keep in mind that even the apostles didn’t understand that Christ had to die as the final, once-and-for-all-times sacrifice for man’s sins. The apostles knew He was the Christ, by His miracles and His teachings, which matched the Old Testament descriptions of the Messiah’s work. But neither the apostles, nor the Jewish religious leaders understood the prophesies regarding His death, and the price He’d pay for us with His redemptive shed blood, as spelled out in Isaiah chapter 53, Psalms 22 and other Old Testament Scriptures. The people of Israel actually believed and taught that the Messiah would come and restore Israel immediately, i.e., that there would only be one advent, and not two. As you can see, the apostles believed that Jesus would redeem Israel and restore the kingdom at that first advent. So even those who had walked and talked with Christ didn’t fully understand the fact that the prophesies of Isaiah 53, Psalms 22 and other Old Testament Scriptures applied to the Messiah, and not to some prophet of old. Even today, the Jewish religious leaders still claim those Old Testament Scriptures apply either to an unnamed prophet of old, or to a prophet yet-to-come. But they vehemently deny they apply to Jesus Christ. Jesus, disguised as a traveler, had to open the apostles’ eyes to the Old Testament Scriptures about the Messiah’s death for the sins of mankind, and His subsequent resurrection, which defeated death. Yes, even the disciples needed to have their eyes opened to the Scriptures regarding the reason for Christ’s death on that cross at Calvary. How Could the Pharisees and Sadducees Know, if the Apostles Didn’t? So if even the apostles, who were taught by Christ Himself, and who were operating in the Spirit of God, hadn’t fully understood the Old Testament prophesies regarding the death and resurrection of the Messiah, how can we expect the purely flesh-thinking and legalistic (rather than spiritual) Jewish religious leaders to have understood the prophesies? Indeed, Christ’s parable of the man who planted a vineyard and rented it out to the “husbandmen” demonstrates that the Jewish religious leaders were solely thinking about earthly, flesh things and not spiritual. Even when some members of the Jewish religious hierarchy finally recognized Christ as the true heir of God, they still worked to have Him killed because they thought, in strictly earthly/flesh terms, that with the Messiah out of the way the kingdom would revert to them and their hold on it would be solidified. The vineyard is Israel. The “husbandmen” are the people of the land. The kingdom of Israel was established by God and was supposed to produce “fruit” for Him, meaning bring more people into the kingdom and teach them God’s ways. The Israelites were supposed to be a “light unto the Gentiles” (Isaiah 49:6), drawing them to God’s Word. But over the long course of time, Israel had ended up under the thumb of the false Jews (Revelation 2:9; 3:9; John 8:44), who instituted empty religious tradition (i.e., playing church) in place of God’s Word. Christ would later explain that down through the long course of time the Jewish religious leaders themselves had been fully responsible for the deaths of God’s prophets (Matthew 23:29-36). Surely, the vineyard planter thought, if I send my only begotten son, they’ll recognize Him as the Messiah — the true heir — and they’ll repent and treat Him respectfully, giving Me my due compensation from the vineyard. The head honchos among the Jewish religious leaders recognized Him as the legitimate heir of the kingdom, and had Jesus carried outside of Jerusalem to that cross on Golgotha, and hung until dead. Why? Because they thought that would put the kingdom of Israel squarely and solidly into their hands. Even the Jewish religious hierarchy who secretly recognized Christ as the Messiah of God (i.e., “this is the heir”) were thinking solely in earthly and fleshly terms. They thought they could defeat Messiah — the heir — and thereby take the kingdom for themselves by force. They couldn’t think spiritually, because the Holy Spirit of God is not with them. So they couldn’t “see” that Christ’s shed blood would not only provide the redemption necessary for the sins of the people, but would also serve to defeat Satan, as well. By rising from the dead, Christ Jesus defeated death. It could not hold Him. Nor can it hold any one of us after our flesh body dies, as long as we’re found to be “in the Lord” as an active and faithful part of His spiritual body. Here’s the only place I know of in the New Testament in which one of the Jewish religious leaders understood Christ would have to die for the people. Joh 11:50 Nor consider that it is expedient [i.e., advantageous] for us, that one man should die for the people, and that the whole nation perish not. In other words, Caiaphas the high priest — alone among the Jewish religious leaders — recognized that Jesus had to die for the people of Israel. But if you read between the lines, he thought Christ’s death would solidify the nation into hands of the Jewish religious leaders, even bringing back to the nation of Israel the scattered remnant of Israelites who dwelt in foreign countries. In other words, this Jewish religious leader thought Christ’s death would result in the immediate reinstitution of the kingdom, under their control. So their reason for plotting Christ’s death was strictly fleshly and self-serving. Just as Judas Iscariot likely believed Christ’s death would result in the immediate restoration of the kingdom of God, in Israel, with himself as its treasurer, so these Jewish religious leaders decided that Christ’s death would put the kingdom of Israel firmly into their hands. The bottom line is that they just didn’t know the truth. They had been taught from childhood, through their own religious tradition (now known as the Talmud), that the true Messiah of God would arise from among the people and restore the kingdom to them immediately. Yes, Satan is indeed quite intelligent. And yes, he knows God’s Word. But it’s God’s Old Testament law, in particular, that Satan is expert in, since he’s the chief prosecutor of heaven, so to speak. So he knows God’s law far better than we do. But that doesn’t mean he fully understood God’s prophesies. He’s a “Scripture lawyer” as Pastor Arnold Murray used to say. Not a prophet. Like the apostles, we can only understand God’s prophesies in hindsight. For example, we can go back to the very first prophesy given in Scripture by God Himself — i.e., Genesis 3:15 — and we can immediately see that it means Christ would eventually be crucified at Satan’s behest, but that Satan will have his head crushed in the end. But our present-day understanding of that verse comes about only because the crucifixion has already happened. 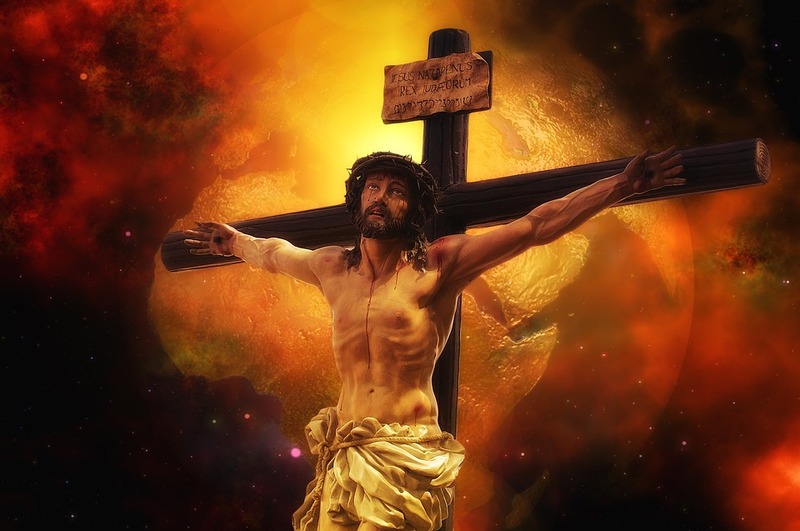 The nails have long-since been driven into Christ’s heels on that cross. And many apostles of the Lord have written to explain to us how that crucifixion relates to the Old Testament Scriptures. Had you or I been alive in the Garden of Eden, and had either of us been eye-witnesses to God speaking this prophesy, we couldn’t possibly have known in advance that God’s words to Satan saying “thou shalt bruise His heel” would mean Christ would be nailed to a cross as the sacrificial Lamb of God and pay for all our sins with His shed blood. And neither could Satan know the full extent of that prophesy in advance. It’s not like God sits up there in heaven explaining His prophesies and His spiritual battle plans to His chief enemy. No good military leader shares his battle plans with the enemy. Satan had a good, general idea that God was going to send a Messiah to save His people Israel. And he figured that stopping this Messiah by killing Him was the only way he could win. But the question is, did he know much more than that? Just as God had held the disciple’s eyes shut in Luke 24:16 above so they couldn’t recognize Christ, does He not have the power to hold Satan’s eyes shut to certain key elements of His great plan to save His children, as well? In other words, by personally paying the price for our sins with His shed blood, Christ beat Satan’s prosecutorial plans to force God to judge and condemn all of His children to hell for their sins. Christ’s death gave God’s children a way out of the power of death (i.e., sin) that Satan held over their heads. In other words, He made an open show of His victory over the forces of death. Think about it: There’s none of us without sin. And sin that’s not been repented of ultimately leads to death (I Corinthians 15:55-57). So if Christ had not died on that cross, God would have had to condemn millions or maybe even billions of His wayward children to death for their sins. But Satan, as the corrupt prosecutor of heaven (who tempts us to sin, then tries to convict us of those sins before God) and his rigged jury of followers (i.e., the “principalities and powers”) were beaten at their own game by God, in the form of the Living Resurrected Savior. In short, God blinded Satan and company to the full extent of His spiritual battle plans. And then, after Christ paid the price for our sins, He opened the eyes of the enemy “making a show of them openly, triumphing over them in it” to show them they’d lost the game. Indeed, the word “spoiled” in Colossians 2:15 above means to divest, or to strip of all authority. Satan now has no authority from God to prosecute faithful Christians — unless, of course, we unwittingly allow it by embracing false religion in place of the Living Word of God, which in turn puts us back under the law instead of under Christ’s grace. By embracing Christ as the Victor over death, we can now ask, rhetorically, as did St. Paul, “Oh, death, where is thy sting? Oh grave, where is thy victory?” (1 Cor. 15:55). If we stay faithfully centered in Christ, Satan’s prosecutorial powers against us are now essentially null and void. Christ intercedes against Satan, on our behalves. Of course, Satan will still come to this earth in His role as the false messiah and try to prosecute us for the “sin” of not worshipping him as “God.” But that is no sin at all. And therefore God, as the presiding Judge who always has the final word, will not condemn us for it. What’s more, Satan can try to prosecute us for our legitimate sins, as well. That’s his job, essentially, as the “accuser of the brethren, which means basically that he’s the chief prosecuting attorney of heaven (Rev. 12:10). But upon sincere repentance, Christ makes intercession for us, as our spiritual defense attorney, neutralizing with His shed blood the sins we would otherwise have to be prosecuted for and die for. Thanks to Christ’s redemptive act on that cross at Calvary as the Lamb of God, and our faithful embrace of His shed blood, there is no one who can legitimately lay spiritual legal charges against those who God has justified through Christ’s shed blood. And that’s what Satan and his children the Kenites (I John 3:12) missed completely.